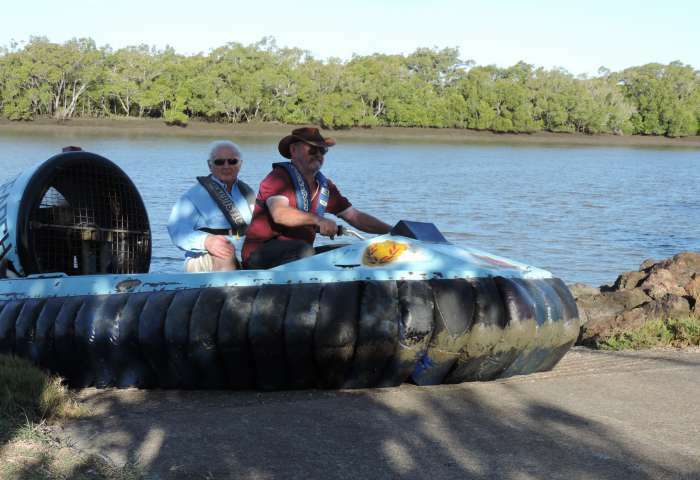 The Queensland branch of The Australian Hovercraft Federation held a planning meeting on Tuesday, 18th March 2014, in the lunch room of Lifts Forklifts Australia, 165 Queens Road, Kingston, Queensland courtesy of Dale Baxter and his employer. Other members attending were Arthur Stead, Dale Baxter, Brandon Bull and Michael Stephenson. Visitors for the evening were , Susan Stephenson, Dieter Reniesch, Dave & Michael Leonard and Steven Stephens. Apologies from Ben Woodhead and Bill Toppin. 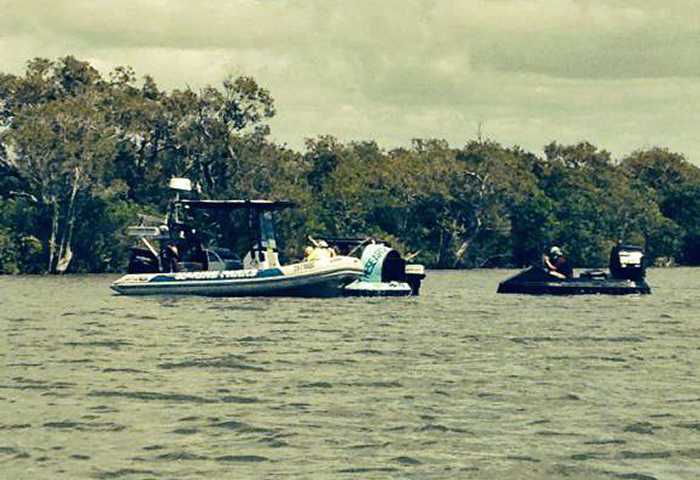 Cruise report - Muriel St, Redland Bay - Sunday 2nd March 2014. 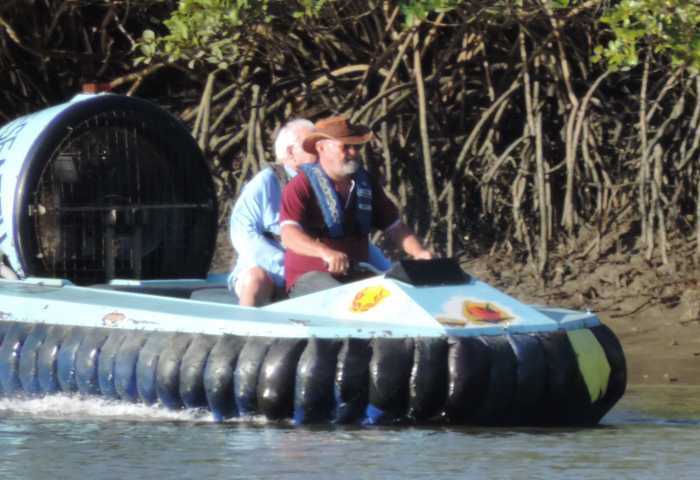 The last club cruise was held on Sunday 2nd March 2014, launching from 96 Muriel Street, Redland Bay courtesy of Peter and Elaine Venn. Three separate cruises were held during the day. Angus Kerr Viper Cruiser powered by a Subaru 1800 EA81. Ben Woodhead Black Turbo Vortex powered by a Suzuki Swift engine. Cle Sheck Turbo Wedge 235 powered by a 2 cylinder 4 stroke Honda GX620. Steven Odgaard Billy Baker 2 powered by a 44hp Chaparral - static display. Richard Annette 14.5 ft Easy Rider runabout powered by a 25hp Evinrude. Other club members and visitors attending were Brandon Bull, Bill Toppin, Arthur Stead, Ann Kerr, Rita Chaffey, Elaine Venn, Dwayne Morgan and Richard Annette. Lucinda, Layla & Harrison Baxter and Don & May Venn also showed up during the afternoon to see how things were going. Peter Venn and Bill Toppin led an early morning cruise down the Redland Bay Passage to Pannikin Island then west and around St Clair Island. The high tide presented no mud flats in the shallow channel south of Point Talburpin. Following were Angus and Ann Kerr in the Viper 4 cruiser and Steven Odgaard and Richard Annette in the blue Expo Turbo. The blue Turbo is now exhibiting its original Expo 88 motif after some delicate Michael Angelo artwork restoration with wet and dry sandpaper. Angus and Ann lead the next cruise to Rocky Point near the mouth of the Logan River. 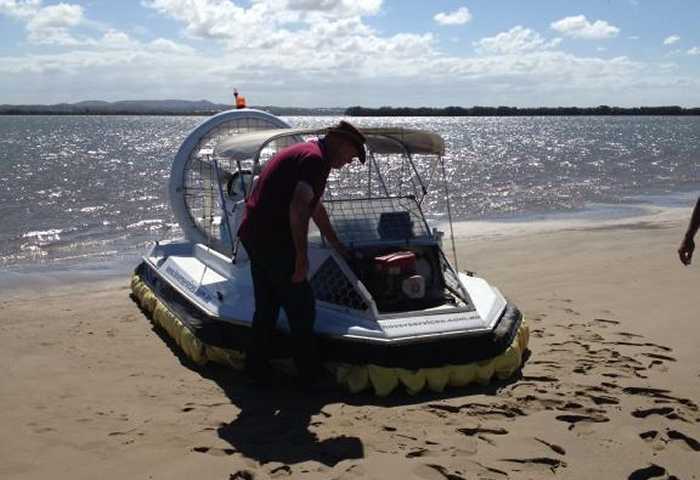 Ben Woodhead participated with his black Turbo Vortex and Steven and Rita in the blue Expo Turbo were escorted by Richard Annette in his 14.5 ft Easy Rider fibreglass runabout boat powered by a 25hp Evinrude outboard engine. The marine park rangers pulled us up in the Logan River near Redbill Passage and checked our permits. Only Angus has his permit on board. The rest of us received a warning and were instructed to carry our permits on board as a condition of being allowed to operate in a marine park. We continued up the Logan River as far as Alberton where we refuelled at Ross McLeod’s boat ramp. Richard Annette enjoyed his trip as safety vessel for the hovercraft. The third cruise was lead by Peter Venn and Cle Sheck in the TP6 closely followed by Angus Kerr and Brandon Bull in the Viper 4 cruiser. Ben Woodhead followed as far as Lagoon Passage then turned back and Richard Annette and Steven Odgaard in the small Easy Rider ran into shallow water at the northern end of Pannikin Island and also turned back. The TP6 and the Viper continued north to Garden Island then back via Long Island and Lagoon Island returning south along Lagoon Passage at low tide at 2:50pm. Ben Woodhead invited me over to his hovercraft work shed on Saturday 5th April to see his 14hp 2 cylinder Briggs and Stratton lift engine driving a white 5Z Multiwing lift fan in a black fibreglass hull with as yet, no skirts nor thrust fan. Ben is making good progress with his twin engine machine and being a professional lawn mowing and landscaper will soon have more time to spend on his project as winter approaches. I have been busy maintaining my Mariah 425 - had a bit of an oil leak in the engine bay, and it took a bit of finding... busted vent hose from the dry sump. Anyway, got it fixed n then tried to start it -- no go -- checked out a few cables n found that a shed rat had chewed thru an electric wire on the motor harness.... fixed that one n all is good... well... until I checked the lights!!! flashing light works, but no others. So now gotta find that n sort it out. Been a little quiet in the West. I have been busy with the Shuttle and with the cricket season in progress just don't have time to organise a cruise. The cricket season has two more weeks to run and we'll get back into it. Neil has repaired the Mariah which had an oil leak, so he is ready to go. No progress made by anyone else. To be fair it has been hot, so working in a shed is not much fun. 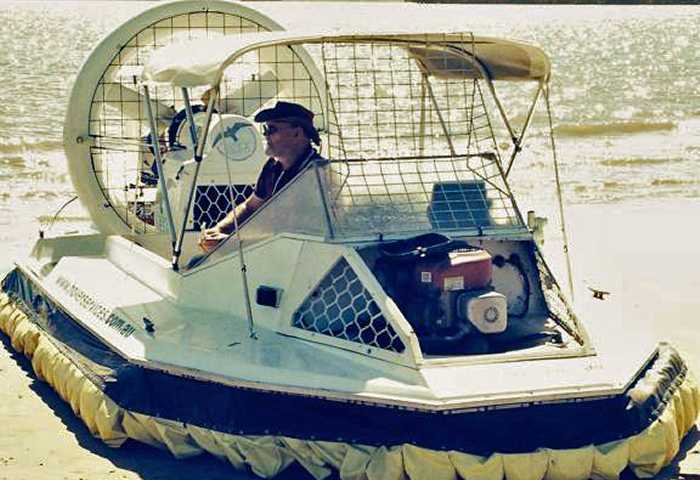 Spring and Autumn are the months to get hovercraft built. In the summer glass and bog go off way to fast. The shuttle is almost done, so close it is frustrating. All the little bits and pieces are holding me up, like getting the lift fan speed and pitch at optimal levels. I have yet to start the thrust system. It is wired and does turn over. It looks very impressive with the 62 inch 3 blade propeller. It should produce epic thrust. I hope to have it done sooner rather than later as my enthusiasm is waning and I really just want to go for a ride. I have had the beast for over a year and managed just one dud run it. 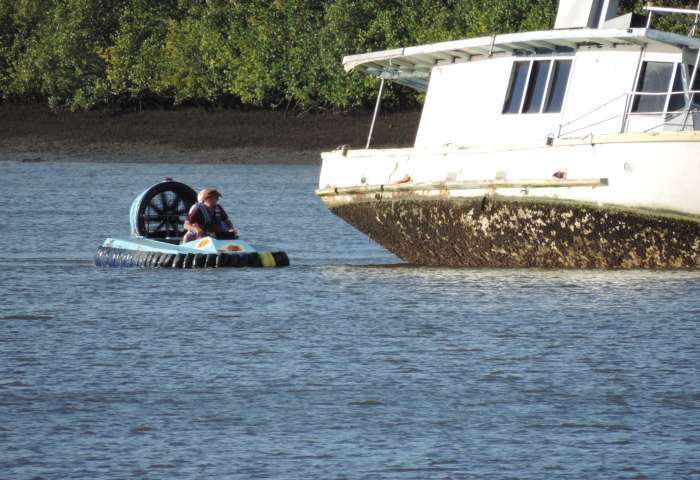 The next club cruise will be held on Sunday 13th April 2014 at Muriel St, Redland Bay. The next club meeting will be held on Tuesday 15th April 2014 at 7:30pm. It will be held in the lunch room of Lifts Forklifts Australia, 165 Queens Road, Kingston, Queensland. This will be a branch annual general meeting to elect a new committee and state delegates for the year. The club venue is provided courtesy of Dale Baxter and his employer. UBD Reference - Map 242 J12.